Despite recent efforts to repeal, replace and/or modify, the Affordable Care Act (ACA or Obamacare) is something that employers need to think about and remain in compliance … at least for 2017. The Employer Shared Responsibility (Section 4980H) and Reporting Requirements (Section 6055/6056) under the Affordable Care Act are compliance nightmares. There are many layers, the whole process stinks and sometimes you just want to cry. Join NAE and Lisa Slook, CEO of 1095HelpDesk.com, to peel back the layers. This training will review the upcoming reporting deadlines and discuss the changes employers need to know for 2017. Are you an Applicable Large Employers or ALE’s? Not sure? If you have multiple businesses, a seasonal workforce, high turnover, union employees and/or are hovering around 50 employees you may need to comply with this mandate. 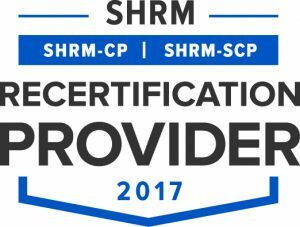 This program has been submitted for 1 HR (General) recertification credit hours toward aPHR™, PHR®, PHRca®, SPHR®, GPHR®, PHRi™ and SPHRi™ recertification through HRCI.